Brilliant entertainment at Cork ScÃ³r na bPaistÃ­ Finals. National School children revelled to a terrific atmosphere generated at the Cork ScÃ³r na bPaistÃ­ Finals hosted in the Ãire Ãg GAA Pavilion, Ovens. The cream of cultural talent surfaced from enthusiastic participants drawn from across the county. A double for Ballyvongane helped the Mid Cork school land the Best Overall Entry while Boherbue regained a hold of the Padraig Ã CearÃºil Cup for Best ScÃ³r Club in the county. Rince Foirne: (1) Boherbue, (2) Summercove Kinsale. Rince Aonar: (1) Marian Creedon (Kilbarry NS), (2) Anna Collins (Illen Rovers. AmhrÃ¡naÃ­ocht Aonar: (1) Maggie Moynihan (Cullen), (2) Erin Hickey (Bweeing). Aithriseoireacht: (1) Cliodhna NÃ­ ThrinlÃºin (GS an Teaghlaigh Naofa Ballyphehane), (2) Shannon Buttimer (Dohenys). Ceol Uirlise: (1) Ballyvongane N.S. (2) Scoil Naomh Caitriona, Ballyvongane. 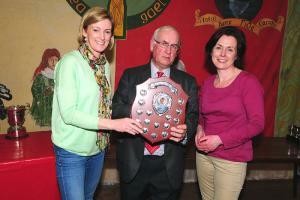 Ceol Aonar: (1) Sarah Leahy (Goggins Hill), (2) Margaret Murphy (Gabriel Ladies Football). LÃ©iriÃº: (1) Ballinadee - Courcey Rovers, (2) Carrigtwohill Ladies Football. BailÃ©ad GhrÃºpa: (1) Ballyvongane, (2) Cullen. SeanÃ³s Dancing: (1) Cian Broderick (Knockaclarig), (2) Molly NÃ­ Bhraoin (Naomh AbÃ¡n), (3) Maeve Kingston (Tadhg MacCarthaigh). Rince Seit: (1) Newmarket, (2) Dunderrow Kinsale. TrÃ¡th na gCeist: (1) Knocknagree, (2) Cloghroe N.S. Inset: Ballyvongane N.S. Grett Buckley and Liz Horgan accept the Best Overall Entry from Pat Malone, Chairman, at the County ScÃ³r na bPaistÃ­ Final.